All seats taken, 3 ales on. Rooster's - Baby-Faced Assassin 6.10 Lovely smooth pint with a kick. Evening visit until 9.30pm close. Small band of drinkers in situ until last knockings. Finished on a bottle of Gadds' DogBolter for an early nightcap. Northdown - Muggy Porter 5.00 Not so sure about this one. Collection of Ales of Thanet for distribution. Lunchtime visit and a good chat with Colin. First pub of the day. Gareth and I walked here from the station and met Ian after 15 mins as his train had been delayed. Handful in. Friendly as ever. Nearly caught by new 9pm closing time Tuesday to Thursday, allowed in by the skin of my teeth and against all the odds. The pub is found in Ramsgate, Kent, CT11 9LR. 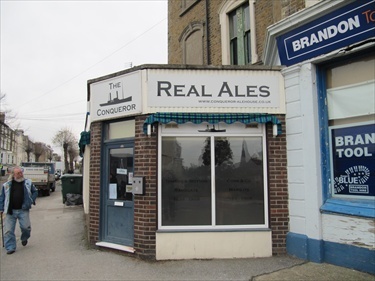 Micropub located in Grange Road towards the sea end. Located on Stagecoach East Kent's Thanet Loop bus route which also conveniently serves Ramsgate Harbour and Ramsgate railway station. A former corner shop converted to a pub specialising in real ales. There is no bar, and no television or fruit machines. Beers are served by gravity dispense, and one cider is usually available. Keg beers and lagers are not sold in this pub which opened for business on 16 November 2010. Awarded CAMRA Thanet Branch's Pub of the Year 2012. Awarded CAMRA's East Kent Pub of the Year for 2012. Awarded CAMRA's Kent Pub of the Year 2012 in August 2012 so became one of the last 16 in CAMRA's National Pub of the Year for 2012 competition. In November 2012 selected as one of the last 4 in the CAMRA National 2012 PoTY competition. We have visited this pub 223 times, seen 261 different beers and tried 214 of them.